Killer Whale Menopause May Be Tied To Competition For Food : Shots - Health News Killer whales are one of only three species known to have menopause. Researchers are looking at the conflict and cooperation between older and younger female whales to understand why. The killer whale J2, better known as "Granny," pokes her head out of the water in the Salish Sea near the San Juan Islands of Washington in July 2016. Granny, who was thought to be about 105 years old at the time, was presumed to have died later that year. Killer whales are one of only three species known to have menopause — the others are pilot whales and humans. Researchers have long wondered why it was that these few species evolved to have females that spend so much of their lives unable to have babies. Killer whales start reproducing around age 15, but stop having calves in their 30s or 40s, even though they can live for around a century. 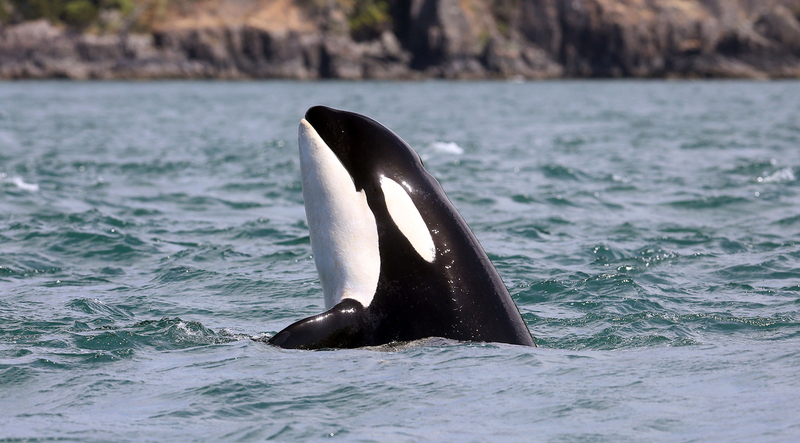 A team led by behavioral ecologist Darren Croft of the University of Exeter decided to search for answers with the help of an unusual long-term study of killer whales in the Pacific Northwest. There, since the 1970s, researchers have carefully collected information on the births and deaths of individual whales that live in family groups. Contained within the data is an intriguing clue about why female whales may stop reproducing later in life. When older females reproduce at the same time as their daughters, who live alongside them, the calves of the older mothers are nearly twice as likely to die in the first 15 years of life. But when older mothers had calves in the absence of a reproducing daughter, their calves did just fine. "It's not that older mothers are bad mothers, that they're not able to raise their calves as younger mothers," says Croft. "It's that when they enter into this competition with their daughters, they lose out and their calves are more likely to die." The competition may center on access to food, says Croft, because there's good reason to believe older females feel more pressure to share their precious fish with the others around them. That's because, in killer whales, females mate with males from other groups but then rejoin their families. That means when a new calf is born, its father is not around, and females start their lives in a situation where their relatedness to the group is rather low. As a female grows older and starts having calves that stay with her, however, she develops more kinship ties to those around her. "It may be that older females are more likely to share, and younger females are less likely to share food," says Croft. That would mean younger females would have more resources to lavish on their own calves. It's clear that in these whales, older females play an important role in the survival of not just their own calves, but all of the family members they live with. "If an old female dies, her son's risk of dying in the year following her death is over eight times higher than if his mother was still alive," says Croft, "and these are adult sons, these are not juveniles, these are 30-year-old, fully grown males." The idea that older females safeguard and enhance their genetic legacy by protecting and providing for their children and grandchildren has been an influential explanation for why menopause evolved. It's known as the Grandmother hypothesis, and was developed by anthropologists who studied hunter-gatherer cultures. But Croft thinks that alone isn't enough to account for menopause, because other long-lived, social species, like elephants, have older females that help their group but continue to bear young until the end of life. "Just the fact that these old females can store information and share that with the group and increase their survival doesn't explain why they stop reproducing," says Croft. Proponents of the Grandmother hypothesis, however, may not be so convinced that intrafamilial conflict plays an important role. Anthropologist Kristen Hawkes, at the University of Utah, says the killer whales are fascinating, but that they're hard to study. "They're doing all kinds of stuff where you can't see it, and even to get demographic data is just so tricky, because they're all underwater and they're long-lived," she says. She points to one recent study on food-sharing in killer whales that found older females share fish with their older adult sons, perhaps to maximize the males' ability to sire more babies. If that's the case, she says, "it's not the older females and younger females in competition, it's the older females contributing to the enormous success of their sons, and then those baby whales are all born somewhere else. They're not competing, because their moms are elsewhere."